The Sussex Spaniel Temperament makes this breed a solid working dog and a loving, even-tempered pet. Sussex Spaniels are rare in the United States, but they gained some notoriety after Stump, a Sussex Spaniel, won Best in Show at the 133rd Westminster Kennel Club Dog Show in 2009. 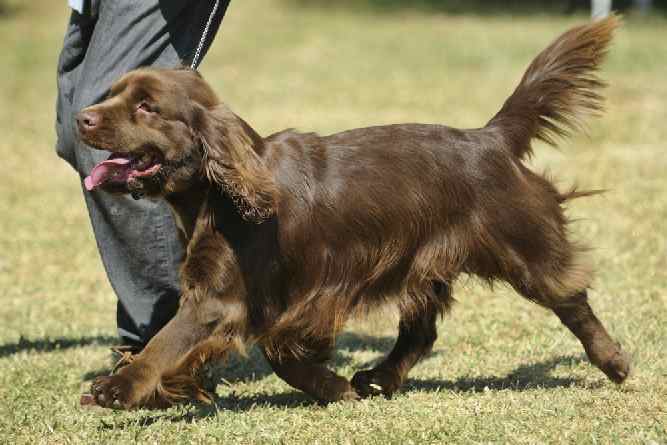 More recently, the breed gained additional fame when Bean the Sussex Spaniel won the Sporting Group at Westminster in 2018. Sussex Spaniels were bred to be “rectangular” and low to the ground so that they could plow their way through heavy brush as they hunted with their masters. Since these stout working dogs were often obscured by the overgrowth, Sussex Spaniels were encouraged to vocalize so the hunters could keep track of their location. As a result, the Sussex Spaniel tends to be a more vocal breed than other spaniel varieties. The Sussex Spaniel is laid-back, easy-going and mellow. This breed rarely gets upset or anxious. They have a moderate energy level. As long as they get daily exercise, they are happy to snooze on the sofa for the rest of the day. Of course, puppies and adolescents require more physical activity than adults. The Sussex Spaniel’s droopy jowls give it a frowning appearance. This is ironic because the Sussex actually has a naturally jolly disposition. The Sussex Spaniel is a happy-go-lucky dog. He gives lots of kisses and tail wags. The Sussex Spaniel gets along wonderfully with everyone, including children and other pets. Of course, early socialization is important. The Sussex Spaniel was bred to vocalize while hunting. This trait is still common in the breed to this day. A Sussex Spaniel might not be the best choice for apartment dwellers for this reason. The origins of the Sussex Spaniel date back to the 1700s. As the name suggests, Sussex Spaniels were developed in the English county of Sussex. During World War II the breed almost disappeared, but a handful of dedicated breeders brought it back after the war. However, the breed is still scarce both in Europe and in America. If you own one of these unusual dogs you will receive plenty of inquisitive looks and questions. 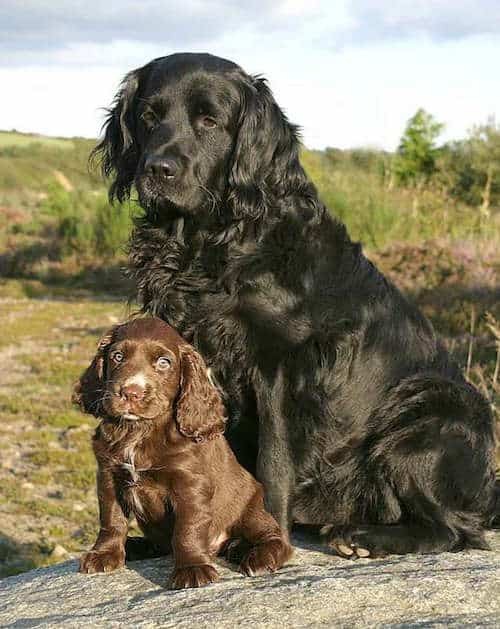 Some owners describe their Sussex Spaniels as a bit “stubborn,” so you will need to maintain patience and a sense of humor while training your Sussex Spaniel. Like all dogs, the Sussex Spaniel learns best through consistent, positive training methods. Avoid trainers that use punishment-based techniques. These types of training methods will deteriorate your relationship with your Sussex Spaniel. Once you have mastered the basic command with your Sussex Spaniel, be sure to check out the exciting world of canine sports! Sussex Spaniels make fierce competitors at Field Trials and Nosework. If you are up for the fun and challenge of training your Sussex Spaniel then check out The Online Dog Trainer by Doggy Dan. The Sussex Spaniel has a very distinctive look—it is short, squat, heavy-boned and muscular. It has a rolling gait due to its little legs. Sussex Spaniels stand only 13-15 inches high, but they weigh between 35 and 45 lbs. Stump actually weighed 50 lbs! Sussex Spaniels have deep chests, droopy faces, and long, floppy ears. The coat coloration is almost always a golden-liver color. Other colorations are disqualified in the show ring. The long, feathery fur requires frequent brushing. Healthy Sussex Spaniels generally live between 13 and 15 years. Skin Issues– often the result of food allergies to chicken, beef or wheat. Ear Problems– those droopy ears retain moisture and debris. Bloat– a life-threatening condition where the stomach rotates. This emergency situation requires immediate corrective surgery. Hip Dysplasia– All breeding dogs should receive an acceptable “hip score” from a licensed veterinarian before breeding. Like all dogs, your Sussex Spaniel should visit the vet at least once per year for a check-up and vaccinations. Monthly heartworm prevention is crucial. Note: Our Health is #1 Priority. It should be no different or your Sussex Spaniel. But you need to help him. The Ultimate Guide to Dog Health is the answer. This handy guide will help you recognize the symptoms of the health problems above. Get the knowledge to stay ahead of these terrible issues that can rob your lovely Sussex Spaniel of vigor and life. If you would like to add a Sussex Spaniel to your household, adoption is a great option! The Sussex Spaniel Club of America has a rescue contact who can help match you with an adoptable Sussex Spaniel that will be a good fit for your family. You can also try locating a Sussex Spaniel at your local humane society or animal shelter. Although this breed is uncommon in shelters, it is still worth a visit to put an application on file. If you are open to a Sussex Spaniel mix or another type of spaniel mix, you may find a match sooner. You can set an alert on Petfinder.com and Adoptapet.com that will notify you when a Sussex Spaniel becomes available for adoption anywhere in the country. Most of the Sussex Spaniels in rescue organizations are adult dogs. Usually, they are relinquished because their owners fall upon hard times. Adopting an adult or senior dog is a wonderful thing to do, and it comes with perks! Older dogs are much less rambunctious and destructive than puppies. They are usually housebroken. They do not require nearly as much supervision and attention as younger dogs. The adoption fee at most animal shelters and rescue groups is between $75 and $200, although it varies depending on the group. Sussex Spaniels from rescue organizations will be vetted and altered prior to adoption. If you choose to work with a breeder the Sussex Spaniel price will be between $1,500 and $2,000. Contact the Sussex Spaniel Club for a list of reputable Sussex Spaniel breeders. Since this is a rare breed in the United States, you may have to wait for a Sussex Spaniel puppy to be available from a quality breeder. Once you identify a possible Sussex Spaniel for sale, set up an appointment to visit the breeding facility in person. Never purchase Sussex Spaniel puppies blindly over the internet. You could be tricked into unwittingly purchasing a pup from an inhumane breeding operation called a Puppy Mill. When you visit your breeder, the home should look and smell clean. The breeding adults should be social, healthy, and should not be in cramped cages. The breeder should have medical records for every single dog. The breeder should answer your questions and educate you about the needs of the breed. Good breeders want to make sure that their puppies are going to excellent homes. Conclusion: Why the Sussex Spaniel? Whether you are looking for a reliable working spaniel or a serene family pet, the Sussex Spaniel temperament makes this breed a wonderful choice for many people. If you are seeking a merry, low-key companion, look no further than the big brown eyes of the Sussex Spaniel! Previous post: Glen of Imaal Terrier Temperament (Spirited, Agile): Is He a Good Addition to Your Home?